It’s winter, you’ve been through the holidays and eaten more than your fair share of goodies. You haven’t had time to pursue exercise and with holiday indulgences coming due on the credit card you don’t have spare money to buy a gym membership. So how do you get and stay motivated to trim up for the new year? How can you make sure you get the exercise you need but still save money doing so? Here are some no-gym fee ways to stay motivated and have fun exercising in the winter. Plan On Participating In Your City’s Corporate Challenge. Across the nation, business associates in companies compete with associates in other companies in their city in a large variety of sporting events. These typically occur in spring, but corporate challenge athletes start prepping and practicing early in the year. Most folks can find some kind of event for which they can try out – whether it be track, biking, swimming, team sports such as volleyball, football or basketball or something a bit more on the individual side like fishing or weightlifting. Not only will you be super motivated (after all, you don’t want to look the fool in front of work associates), but you will get lots of exercise as you prepare and practice for the event – as well as on the actual participation day. I participated in my city’s corporate challenge for several years, in the track events – there wasn’t much competition in my age group!! Check with your company’s HR department to see if the company participates. If it doesn’t, you may want to campaign for it to do so! Check Out Your Work Perks. Sometimes your company has perks involving free or reduced admission to bowling teams, softball leagues and other athletic type activities. These activities not only provide exercise, they often are ongoing for multiple weeks, giving you motivation to continue the activity. In addition, you get a chance to get to know your work associates in an informal situation. Hubby and I bowled free with my work associates once a week for 8 weeks! To find these work perks, access the company grapevine as well as the HR department (sometimes HR doesn’t like to advertise that the programs are available as they get expensive with more participants). Many communities have continuing education classes that include active participation. For a nominal charge, you can get multiple sessions of Yoga, Zumba dance or swimming lessons at a facility that is usually close to home (often in the local school facilities). In addition, there may be community adult athletic teams you can join – such as volleyball teams. 10 weeks of volleyball can be a real workout! To find these, look online by searching for “community education your city”. Sometimes the local paper will list them as well or the community education organization may send out a course catalog. Get yourself a used exercise DVD program and have at it in the living room each morning or evening. Outdoor activities are fun in the winter, if you are dressed appropriately. Shoveling snow (or better yet, walking or skiing through it) is great for the circulatory system. Brisk weather makes your walking faster in the winter, with or without snow. Being outdoors can help your mood as well as your waistline – as it may help you avoid cabin fever. Spend Money To Save Money. If you have trouble staying motivated to exercise, you might want to indulge in one of these products to help you keep going. By continuing to exercise your body, you will save money in health costs over your lifetime (and feel better too!). Scientists have noted that folks who weigh in regularly tend to lose more weight and keep the weight off. If you don’t have a good scale, get one and use it. Tracking your heart rate can be an incentive to push yourself toward better health. Aerobic exercise, intended to get your heart rate up to a certain target level, helps you lose or control weight. Walking at least 3 miles per hour, according to the Center for Disease Control, is a moderate-intensity aerobic activity, and is generally safe for most people. 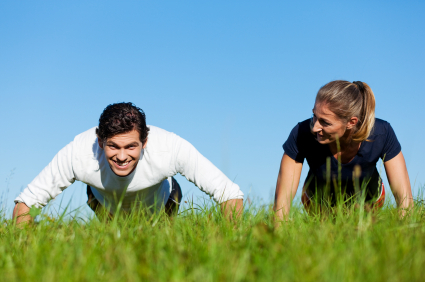 To lose weight, and get healthy, we all need some moderate-intensity exercise each week. Knowing how much you have walked in an hour helps you know whether you are going the distance in the time allotted. A pedometer will not only measure distance, but also the number of steps you take. Steps taken measurement, like time measurement, can be subjective if you don’t track it. You may think you are stepping out much more than you really are! What other ways do you save money exercising? Are there other tools that you use? Gym memberships can be costly and if you don’t go and exercise consistently, are a waste of money. We’ve just had back to back snow storms here so cold and wet is the word of the day here too! These are all great ways to save money on working out. We do quite a bit at home ourselves in order to save money. You can use things like old milk jugs filled with water as weights. We also have an exercise bike we can use as well. My poor exercise bike gets really lonely. I’d rather do aerobics to dvds…..
I’ve taken to use our house as a stairstepper. Sounds silly, but every time I go up or down, I make mayself repeat the exercise two more times. So when I go upstairs to fetch something I forgot, I do the stairs three times. (That’s what it takes to get me winded.) I don’t do twenty minutes at time (which I probably should) but in all I climb about forty stories a day this way. I think each of us needs to do what is right for ourselves. I used to climb stairs (8 floors) morning and evening when I worked down town, but our home is all on one level so now that I’m retired, I no longer see many steps (except the ones I use to do step aerobics)! I do a lot of community-based work where I live and the corporate challenge sounds like a great idea for our town! Thanks for the idea. People need to find ways to get outside and enjoy each other’s company while becoming more physically fit. Why is it that people stop working out once high school sports are finished? Cool, good luck organizing a corporate challenge in your area! We bought equipment and are exercising at home. While the upfront cost was a lot, it will pay itself off. AND we no longer have to drive to the gym. I think that ‘driving to the gym’ is a major obstacle for a lot of us in doing our exercise each day. If it is convenient, close and ready when you are, it is a lot easier to get it done. I’ve seen them too, they are pretty intense! Around here the indoor malls are all ghost towns, all the shops have moved to strip malls! I’m lucky to have 6 acres of trails to walk outside and warm winter clothes and boots to wear when I do. I ride my bicycle 2-7 times a week. My wife and I walk for 30 minutes after dinner. Riding bikes worked for me in losing about 20 pounds when I was in my forties. I would take off every night after supper in the summer and ride 20 miles. Weight came off fast. These are great ideas. We belong to our local community center, which is recently remodeled and just as nice as most gyms for a cost of about $250/yr for a family membership. That is a really good deal! and it’s good to know the elders are exercising! Walks are good. I understand that to get the max benefit though, you have to keep up the pace and not just stroll. One of my best friends bought a heart monitor and a pedometer two years ago, and the two helped her lose 130 pounds without surgery!!!! I’d say they’re motivating! Biometric feedback really can alter behavior! I used a heart monitor when I was in my jogging phase – it helped.